The below chart lists “standard” Slat Conveyors in which we manufacture and sell with highly competitive pricing and lead times. 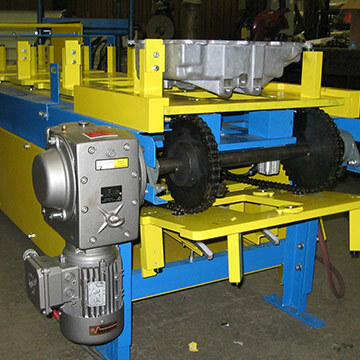 Rolmaster can accommodate most custom “non-standard” Slat Conveyor requests. 6" Pitch, Heavy Duty The SL6, 6" Pitch Heavy Duty Slat Conveyor is designed for heavy duty applications and long lasting service. It can be used for production, assembly line, and many other applications where a flat conveying surface is desired. This conveyor is suitable for conveying hot and oily parts. Conveyor slats can be modified for mounting assembly fixtures. 12-49 in 120-1200 in End Drive, Bottom, Right 15-45 ft/min 3/16" formed steel channel frame construction Sealed pre-lubricated, cast iron flange ball bearings. 6" pitch steel bushed roller chain with two bolt attachment every pitch. Conveyor chains are shipped loose for field installation.